Early folklorists tended to reflect contemporary theories and beliefs, including the view that singing games were a form of pagan survivalism, which led Alice Gomme to conclude that ‘London Bridge Is Broken Down’ reflected a memory of child sacrifice. The origins are obscure as children over many generations have changed the game. 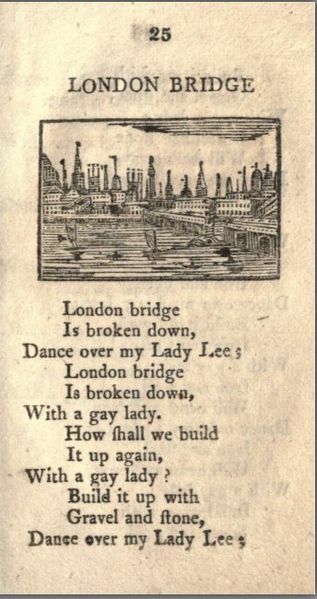 “London Bridge Is Falling Down” (also known as “My Fair Lady” or simply “London Bridge”) is a traditional nursery rhyme and singing game, which is found in different versions all over the world. It deals with the disrepair of London Bridge and attempts, realistic or fanciful, to repair it. It may date back to bridge rhymes and games of the late Middle Ages, but the earliest records of the rhyme in English are from the seventeenth century. The lyrics were first printed in close to its modern form in the mid-eighteenth century and became popular, particularly in Britain and the United States in the nineteenth century. The modern melody was first recorded in the late nineteenth century and the game resembles arch games of the Middle Ages, but seems to have taken its modern form in the late nineteenth century. Several theories have been advanced to explain the meaning of the rhyme and the identity of the “fair lady” of the refrain. The rhyme is one of the most well known in the world and has been referenced in a variety of literature and popular culture. In its most common form it relies on a double repetition, rather than a rhyming scheme, which is frequently used in children’s rhymes and stories. The Roud Folk Song Index, which catalogues folk songs and their variations by number, classifies the song as 502. The melody now most associated with the rhyme. A melody is recorded for “London Bridge” in an edition of John Playford’s The Dancing Master published in 1718, but it differs from the modern tune and no lyrics were given. An issue of Blackwood’s Magazine in 1821 noted the rhyme as a being sung to the tune of “Nancy Dawson”, also known as “Nuts in May” and the same tune was given in Richard Thomson’s Chronicles of London Bridge (1827). Another tune was recorded in Samuel Arnold’s Juvenile Amusements in 1797. E. F. Rimbault’s Nursery Rhymes (1836) has the same first line, but then a different tune. The tune now associated with the rhyme was first recorded in 1879 in the US in A. H. Rosewig’s Illustrated National Songs and Games. Detail from Philippe Pigouchet’s Heures a lusaige de Paris (1497), showing an arch game similar to that known to be associated with the above rhyme. Above is first page of the rhyme from 1815 edition of Tommy Thumb’s Pretty Song Book (c. 1744). “Oranges and Lemons” is an English nursery rhyme and singing game which refers to the bells of several churches, all within or close to the City of London. It is listed in the Roud Folk Song Index as #13190. • Here comes a candle to light you to bed. • Here comes a chopper to chop off your head. On the last word, the children forming the arch drop their arms to catch the pair of children currently passing through, who are then “out” and must form another arch next to the existing one. In this way, the series of arches becomes a steadily lengthening tunnel through which each set of two players have to run faster and faster to escape in time. Alternative versions of the game include: children caught “out” by the last rhyme may stand behind one of the children forming the original arch, instead of forming additional arches; and, children forming “arches” may bring their hands down for each word of the last line, while the children passing through the arches run as fast as they can to avoid being caught on the last word. It was often the case, in Scottish playgrounds, that children would pair into boy and girl and the ones “caught” would have to kiss. There is considerable variation in the churches and lines attached to them in versions printed in the late eighteenth and early nineteenth centuries, which makes any overall meaning difficult to establish. The final two lines of the modern version were first collected by James Orchard Halliwell in the 1840s. Oranges and Lemons was the name of a square-four-eight-dance, published in Playford’s, Dancing Master in 1665, but it is not clear if this relates to this rhyme. Similar rhymes naming churches and giving rhymes to their names can be found in other parts of England, including Shropshire and Derby, where they were sung on festival days, on which bells would also have been rung. St. Martin’s may be St Martin Orgar or St. Martin’s Lane in the city, where money lenders used to live. St Sepulchre-without-Newgate (opposite the Old Bailey) is near the Fleet Prison where debtors were held. St Leonard’s, Shoreditch is just outside the old city walls. St Dunstan’s, Stepney is also outside the city walls. Bow is St Mary-le-Bow in Cheapside. St. Helen’s, in the longer version of the song, is St Helen’s Bishopsgate, in the city. St. Clements’s may be St Clement Danes or St Clement Eastcheap both of which are near the wharves where merchantmen landed citrus fruits. The tune is reminiscent of change ringing, and the intonation of each line is said to correspond with the distinct sounds of each church’s bells. Today, the bells of St Clement Danes ring out the tune of the rhyme.